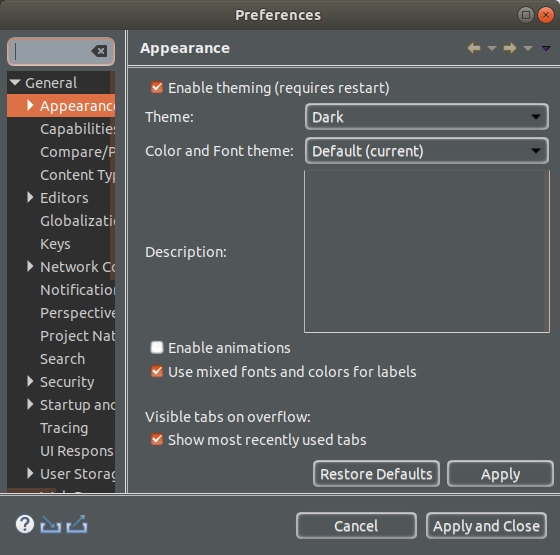 General > Appearance preferences page. 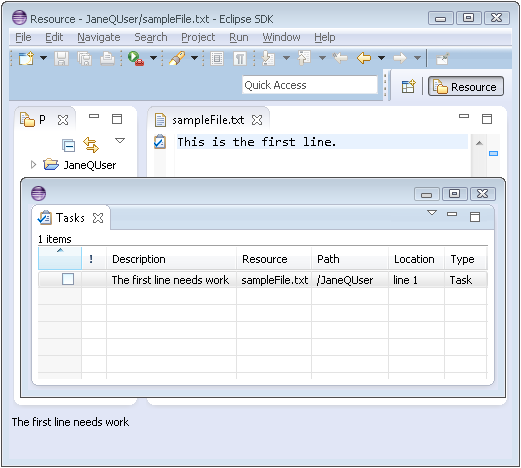 Quick access as a popup If you find the Quick Access field in the toolbar takes up too much space, you can hide it by selecting Hide from the context menu in the toolbar. Full Screen mode You can toggle the Eclipse full screen mode via shortcut (Alt+F11) or menu (Window > Appearance > Toggle Full Screen). 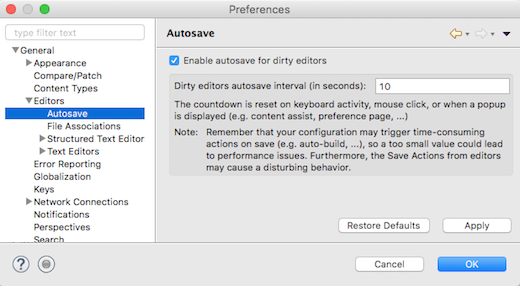 Automatic Save of dirty editors You can configure the automatic save of dirty editors in Eclipse via the General > Editors > Autosave preference page which allows you to enable/disable the autosave and change the interval of autosave. Close Tabs to the Left/Right The context menu of editor and view tabs offers Close Tabs to the Left and Close Tabs to the Right menu to close the corresponding tabs. Restoring a perspective's layout Rearranging and closing the views in a perspective can sometimes render it unrecognizable and hard to work with. To return it to a familiar state, use Window > Perspective > Reset Perspective. Customizing toolbar and menu bar You can customize which items appear on the main toolbar and menu bar using the Window > Perspective > Customize Perspective command. Quickly find a resource Use the Navigate > Go To > Resource command to quickly find a resource. 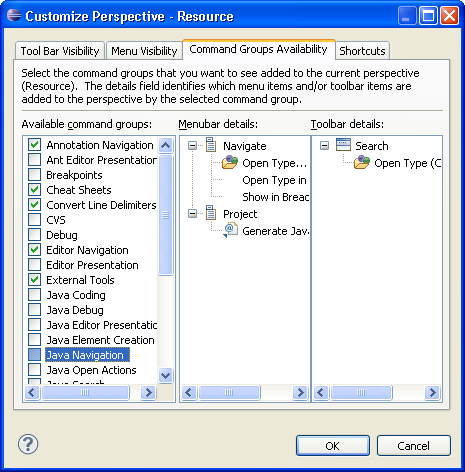 If the Go To > Resource command does not appear in your perspective, you can add it by selecting Window > Perspective > Customize Perspective, then Other > Resource Navigation. 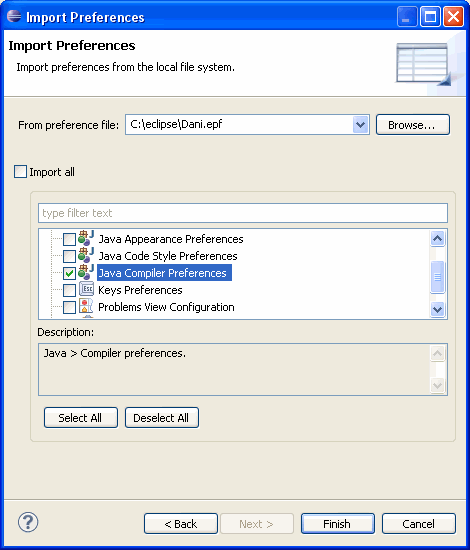 Easily accessible buttons for opening the Import/Export preferences wizard are available in the lower left corner of the Preferences dialog. The wizards are also accessible via File > Import.../Export... > General > Preferences. 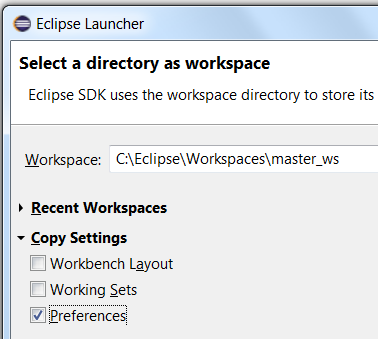 Copy preferences during workspace switch You can copy preferences during a switch to a new or existing workspace. Viewing resource properties Use the Properties view ( Window > Perspective > Show View > Properties) when viewing the properties for many resources. 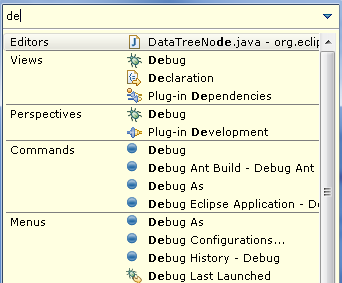 Using this view is faster than opening the Properties dialog for each resource. 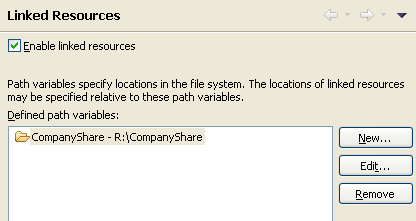 Show workspace path The General > Workspace preference page shows the current workspace path. 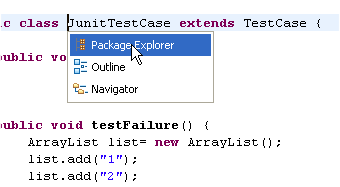 In addition, you can show the path in window title by checking the option "Show current workspace path in window title". The -showLocation command line argument can also be used to show the path in window title and it overrides the preference. 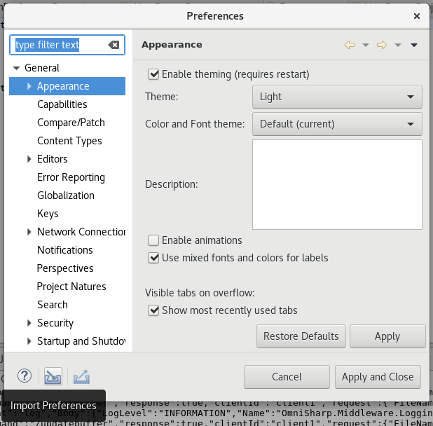 in your .options file or using the General > Tracing preference page. 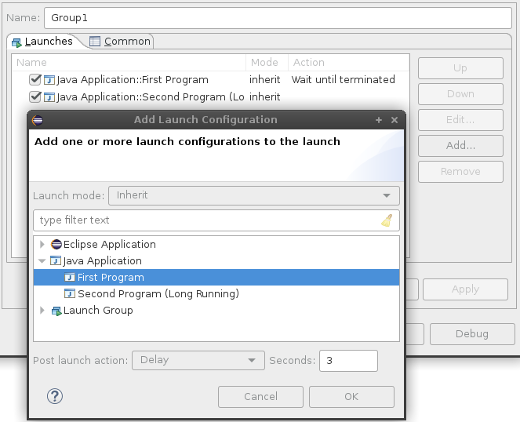 Terminate and Relaunch from history You can use the Terminate and Relaunch while launching from history option on Run/Debug > Launching preference page to configure automatic termination of previous launches while launching from history. 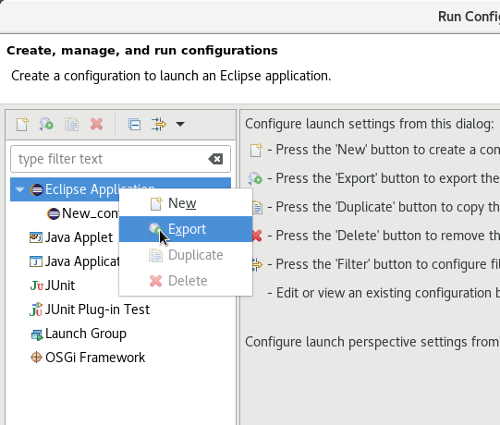 Export Launch Configurations The Export Launch Configurations wizard can be easily accessed via the context menu on Launch Configurations. 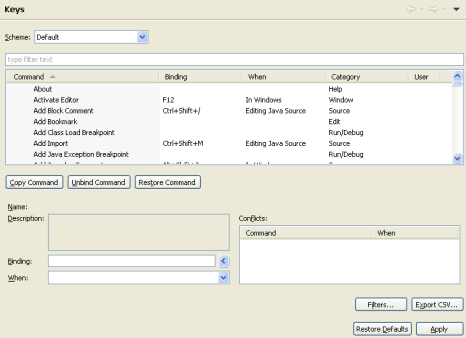 This wizard is also available with File > Export > Run/Debug > Launch Configurations. 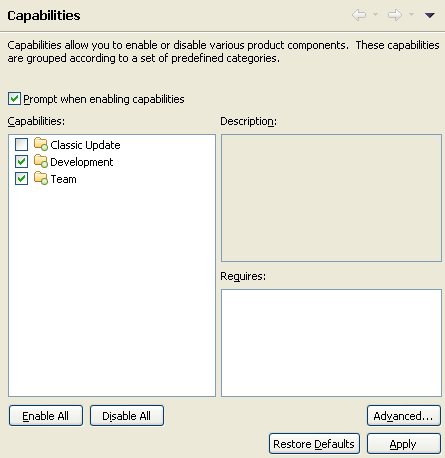 Sort breakpoints by creation time You can use the Sort By > Creation Time option in Breakpoints view's view menu to show the newly created breakpoints on top. Go to last edit location Navigate > Go to Last Edit Location (Ctrl+Q) takes you back to the place where you last made a change. 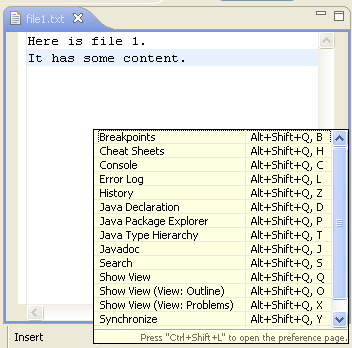 A corresponding button marked is shown in the toolbar. 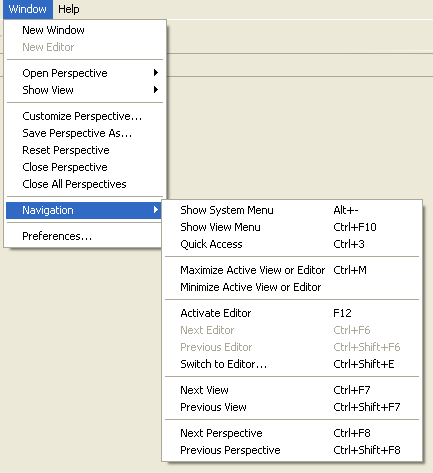 If this toolbar button does not appear in your perspective, you can add it by selecting Window > Perspective > Customize Perspective, then Other > Editor Navigation. 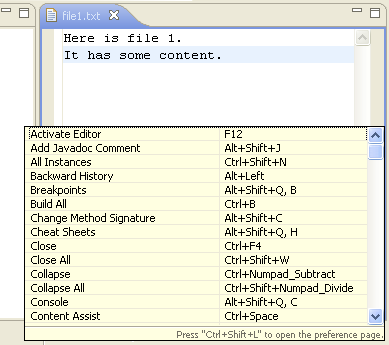 Commands to zoom in text editors In text editors, you can use Zoom In (Ctrl++ or Ctrl+=) and Zoom Out (Ctrl+-) commands to increase and decrease the font size. 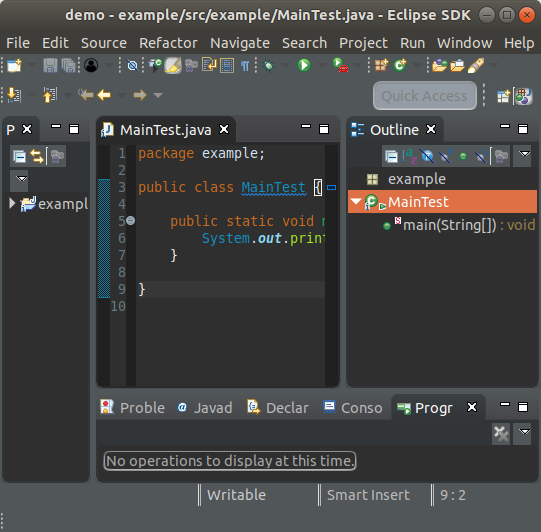 To reset the original font size, rotate two fingers by at least 45o, or close and reopen the editor (Navigate > Back). 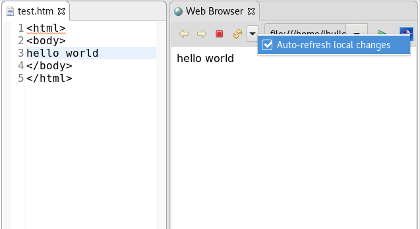 Browser Editor can toggle auto-refresh The Browser Editor contains a drop down option for enabling auto-refresh for local pages. When enabled, the Browser Editor will automatically refresh if the opened file is edited and saved. Determining who last modified a line with the Show Revision Information command The Show Revision Information command allows you to pick any file and get a listing of who changed what line and when. 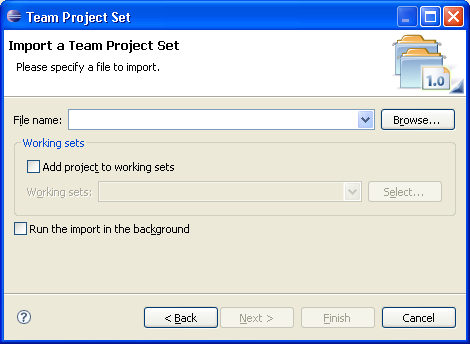 The Team > Show Revision Information action is available from the Project and Package Explorers, and the text editor context menus. The action works in a Quick Diff flavor and displays the annotations in the vertical ruler at the left of the editor. 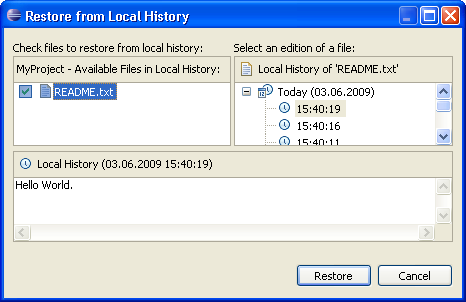 It can also be applied to a previous version file opened from the History view to get the annotations on that revision. 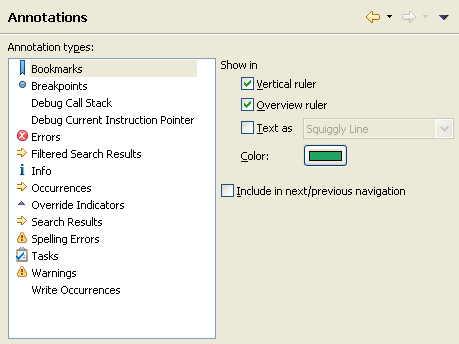 To turn off the annotations, select Revisions > Hide Revision Information from the ruler context menu. 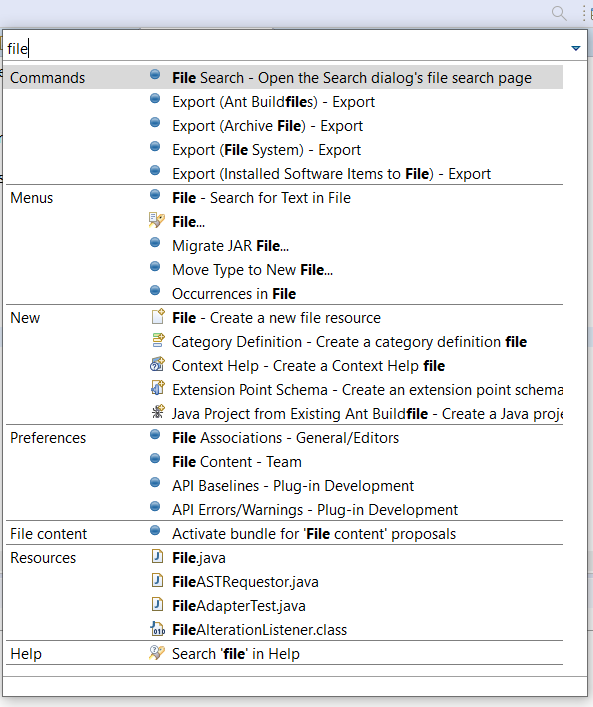 Comparing different versions Select any folder or file in the project explorer and choose Compare With from context menu to compare it against another version, branch, or date. Show ancestor pane in 3-way compares Whenever a team operatoin results in a conflict, it is helpful to view the common ancestor on which the two conflicting versions are based. 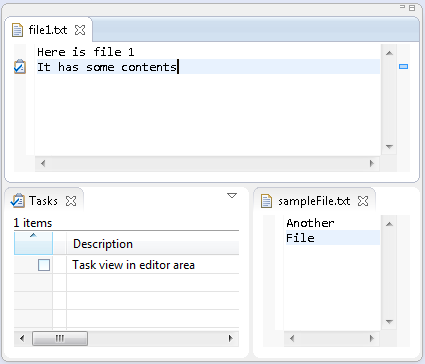 Merge in Compare editor You can merge conflicting changes in the compare editor with one click. Hover over the small square in the middle of the line connecting two ranges of an incoming or conflicting change. A button appears that allows you to accept the change.